Notkler Balbulus, known to posterity as "the stammerer" was a monk at the great Carolingian monastery and center of learning of St. Gall in the eastern part of present-day Switzerland. Notker was born of a well-to-do family around 840 and died in 912. Beside being known for his life of Charlemagne , Notker was responsible for Latin metrical poetry which was chanted after the singing of the Alleluia of the Mass, and its associated verse and preceded the chanting of the Gospel. He was beatified in 1512. In the middle ages, the Alleluia was one of the most elaborate chants in the Mass and was often extended with long textless melismas, known as the jubilus, or "sound of joy." In Frankish churches this was further extended by more wordless channt known as thhe melodiae. As Notker recounts, these "sounds of joy" became increasingly difficult to remember and the great medieval sequences developed as simply memory aids. A fuller biography of Notker can be found at the Catholic Encyclopedia here. More information on Notker's development of the sequence can be found here. The original Latin of the letter translated below, for those of you who prefer that, can be found here. When I was still young, and very long melodiae - repeatedly entrusted to memory - escaped from my poor little head, I began to reason with myself how I could bind them fast. 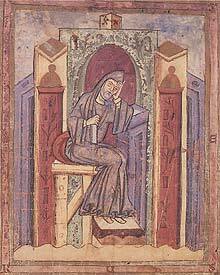 In the meantime it happened that a certain priest from Jumieges (recently laid waste by the Normans) came to us, bringing with him him antiphonary, in which some verses had been set to sequences; but they were in a very corrupt state. Upon closer inspection I was as bitterly disappointed in them as I had been delighted at first glance. Nevertheless, in imitation of them I began to write LAUDES DEO CONCINAT, and further on COLUBER ADAE DECEPTOR. When I took these lines to my teacher Iso, he, commending my industry while taking pity on my lack of experience, praised what was pleasing, and what was not he set about to improve, saying, "The individual motions of the melody should receive separate syllables." Hearing that, I immediately corrected those which hell under ia; those under le or lu, however, I left as too difficult; but later, with practice, I managed it easily. Instructed in this manner, I soon composed my second piece, PSALLAT ECCLESIA MATER ILLIBATA. When I showed these little verses to my teacher Marcellus, he, filled with joy, had them copied as a group on a roll of parchment; and he gave out different pieces to different boys to be sung. And when he told me that I should collect them in a book and offer them as a gift to some eminent person, I shrank back in shame, thinking I would never be able to do that. Recently, however, I was asked by my brother Othar to write something in your praise, and I consedered myself - with good reason - unequal to the task; but finally I worked up my courage (still wth great pain and difficulty) that I might presume to dedicate this worthless little book to your highness. If I were to learn that anything in it had pleased you - as good as you are - to the extent that you might be of assistance to my brother with our lord the Emperor, I would hasten to send you the metrical life of St. Gall which I am working hard to complete (although I had already promised it to my brother Salomon) for you to examine, to keep, and to comment upon. From Richard Crocker, The Early Medieval Sequence (berkeley, 1977), 1-2.